This healthy jambalaya recipe isn't missing a thing with plump shrimp, spicy sausage, and Cajun seasonings. It easily lends itself to a healthy meal that is still low calorie. 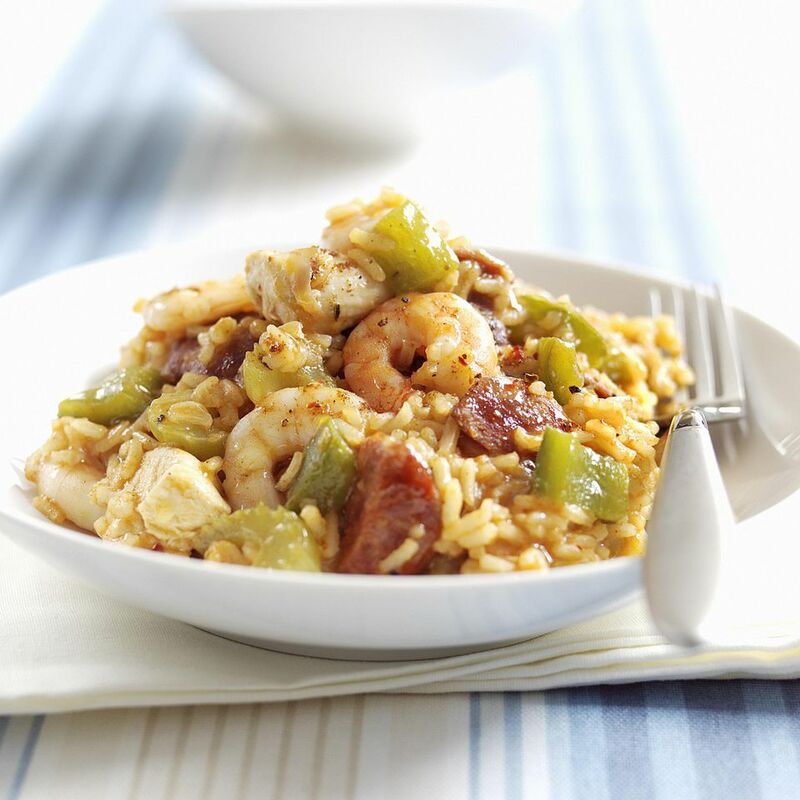 Luckily, the traditional ingredients used in jambalaya are pretty easy to accommodate in a healthy diet. This particular recipe capitalizes on using brown rice as opposed to using white rice, however. White rice is what you would ordinarily use in jambalaya, so a simple substitution of brown rice makes an easy change that gives you an extra health kick. Any dieter or healthy eater would know that white rice is not exactly the best choice when you are trying to eat healthier. White rice has been processed, with most of the natural, healthy portions of the rice being removed. Many of the vitamins and minerals and fiber-containing grain are gone when you open a package of white rice. But if you change that for brown rice, you're now getting fiber, vitamins, and minerals that you otherwise would not be getting. Other ingredients include chicken thighs, shrimp, and sausage. This recipe uses chicken sausage which is lower in fat and calories than ordinary sausage. Shrimp is naturally low in fat and calories, and a small number of chicken thighs, though higher in fat than chicken breast, can still keep the dish lean. The other vegetables and oils used are super healthy, and make an outstanding dish. Celery, green bell pepper, and tomatoes pack in vitamins and nutrients and fiber. In a large dutch oven, place the chicken sausage and chicken over medium-high heat. Do spray the pan with non-stick cooking spray to do this so that your chicken and sausage do not stick to the pan. Continuously stir the meat and the sausage in the pan, and continue cooking until they are lightly browned, and the chicken is no longer pink on the inside. Once the chicken and sausage are cooked through, remove and set aside. Add the canola oil to the pan, and cook the celery, green pepper, and garlic for 3-5 minutes, until tender. Add the thyme and rice, and cook 3 more minutes. Stir in the chicken broth, tomatoes, salt, black pepper, and ground red pepper. Cover, and cook 20 minutes, until the liquid is absorbed. Add the shrimp, and cook 3-5 minutes longer, until the shrimp are bright pink.